Sunday Menu | Happiness is a warm oven. 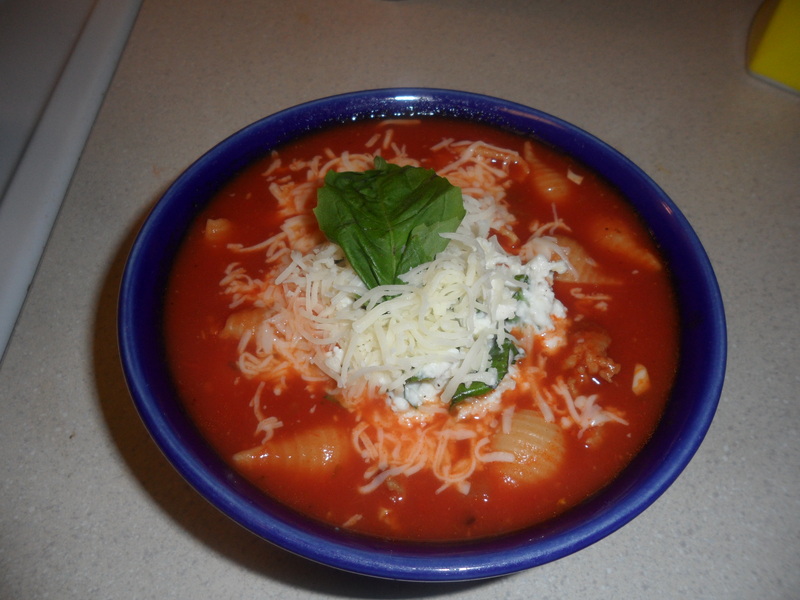 Posted on July 13, 2013 by Jenn C.
I decided to make this recipe after the kids were settled in last night, watching Lion King. I managed to finish it right about at 8, finish my homework, and get into bed around 9. Not too bad. So, now as I wait for my pot of coffee to finish brewing and as the kids watch Mystery Incorporated, I am smelling the crock pot simmering away. The recipe was simple enough. 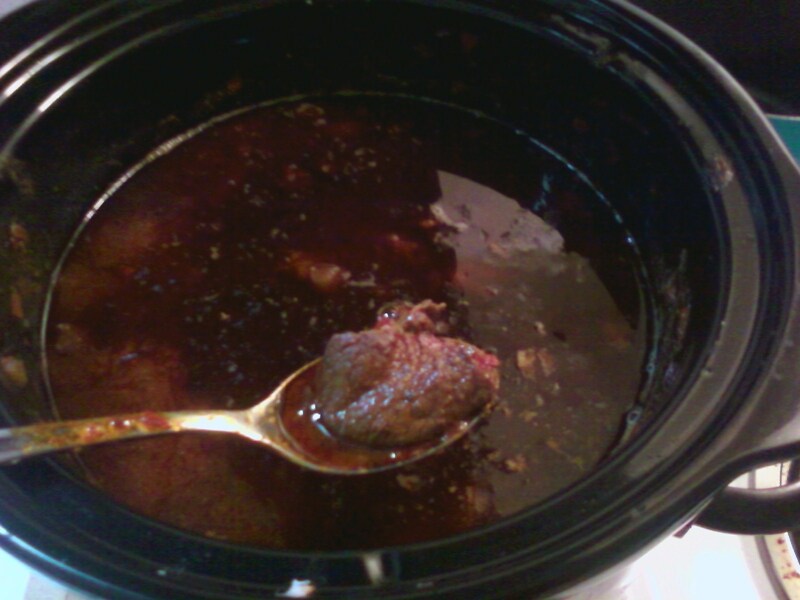 Fry the meat, soak and blend the chilis, combine in a crock pot.Simple stuff. Start by soaking the cleaned peppers in boiling water to cover for 40 minutes. 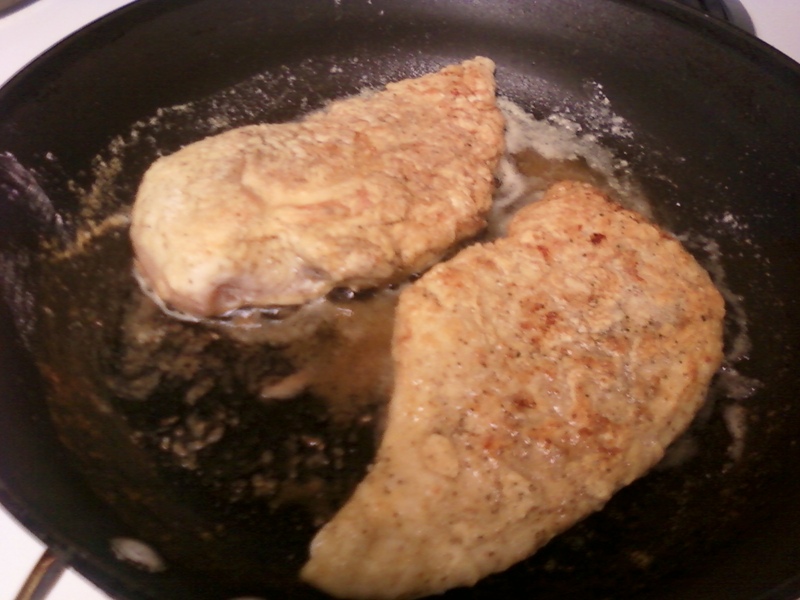 Season the meat with granulated garlic, salt, pepper, and cumin. Brown in small matches to ensure a good maillard reaction. Don’t worry about cooking all the way through. You just want a good sear. 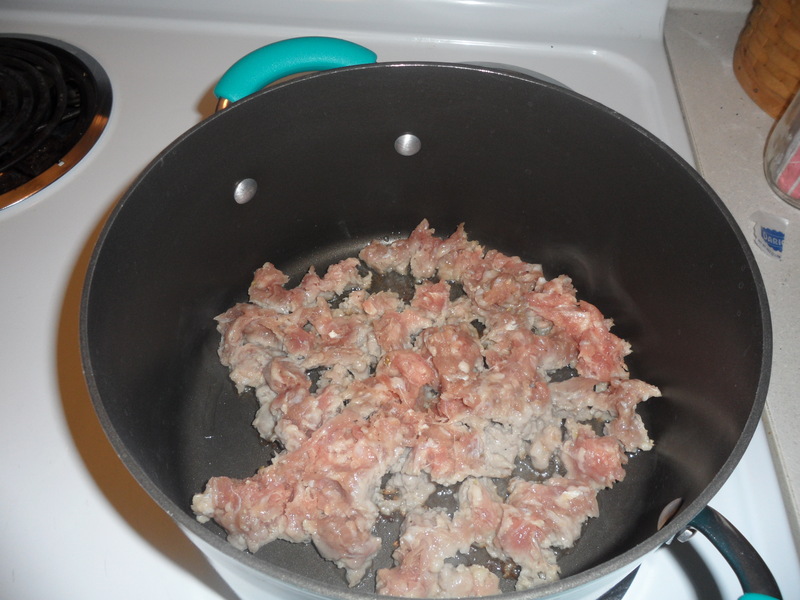 Add the seared meat to a crock pot. 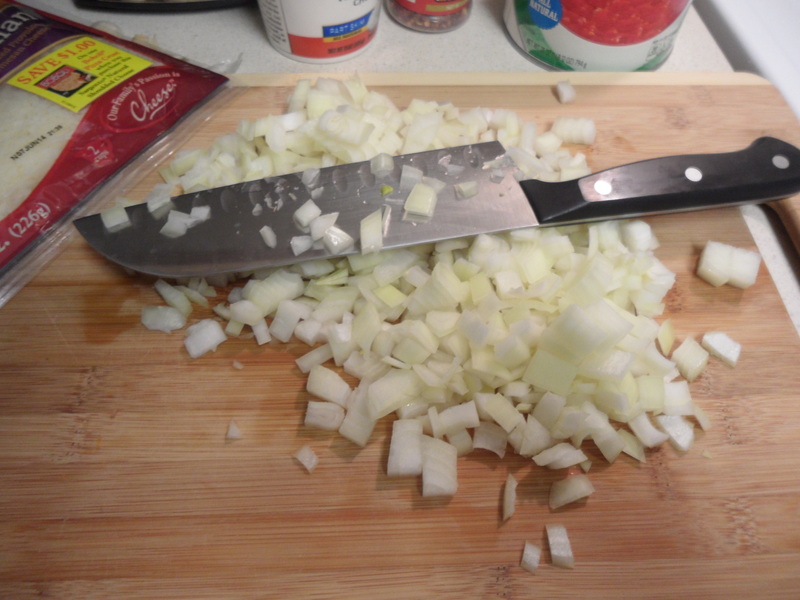 When the meat’s done, sauté the onion and add that to the pot. Retrieve the softened peppers from the soaking liquid and add the peppers, 2 cups of stock, salt, and Mexican oregano to a blender. Blend until smooth. Add the chili puree the meat and onion. Salt to taste and turn it on low. When is it done? I don’t know. Mine has been for about 11 hours now and I haven’t tasted it yet. Figure it out on your own and according to your own tastes. Posted on March 3, 2013 by Jenn C.
This weekend has been a roller coaster. Friday was great. I worked a half day and then Henry and I took the kids to my best friend’s house to play for a bit. We hadn’t had a chance up to that point to introduce her kiddos to ours and it was nice to finally see them together. The toddler (or turdler, as I have been calling him lately) was fussy, but we didn’t know he was sick. Yesterday, with the puke and tears–me trying to get homework done, learning how to co-parent a sick kid within a still new family unit–let’s just say it was a rough day. Today, the turdler is better, but I’m feeling out of sorts. I’m starting to fret about work, about school, and about our upcoming, week-long trip to Washington. Laundry needs to be done. I need a shower. The best I can seem to do today is drink coffee, feel the breeze and sun through the screen door, and try to not be tearful. The carnitas from yesterday are sitting in the fridge, waiting to be used. I am going to throw them into some corn tortillas and make enchiladas. I also made some tomato brown rice to go along with them. Method is simple enough. Warmed tortillas, filled with carnitas and colby jack (what we had in the fridge), covered in El Pato enchilada sauce (my favorite) and bit more cheese on top. I will bake it at 375 for 45 minutes to an hour when the kids wake up from their naps. 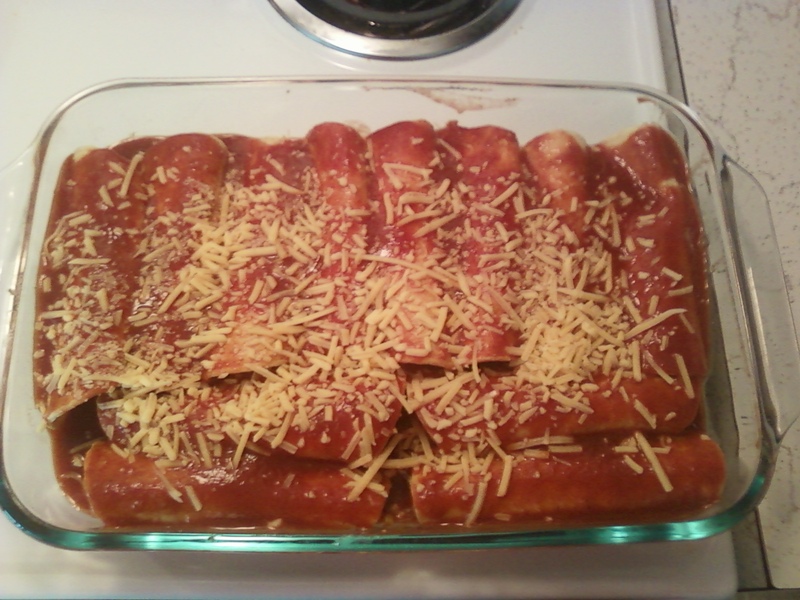 The best part of these enchiladas will be how juicy they are. The beer and orange juice melded with bone marrow and other meat goodness to make a thick gelatin while the roast was cooking yesterday. That gelatin in the enchiladas will melt in the oven and impart it’s richness and juiciness, elevating these enchiladas to something pretty special. Posted on March 23, 2012 by Jenn C.
I never thought I’d be looking to Guy Fieri for an idea on how to tie together shrimp, chorizo, and peppers. 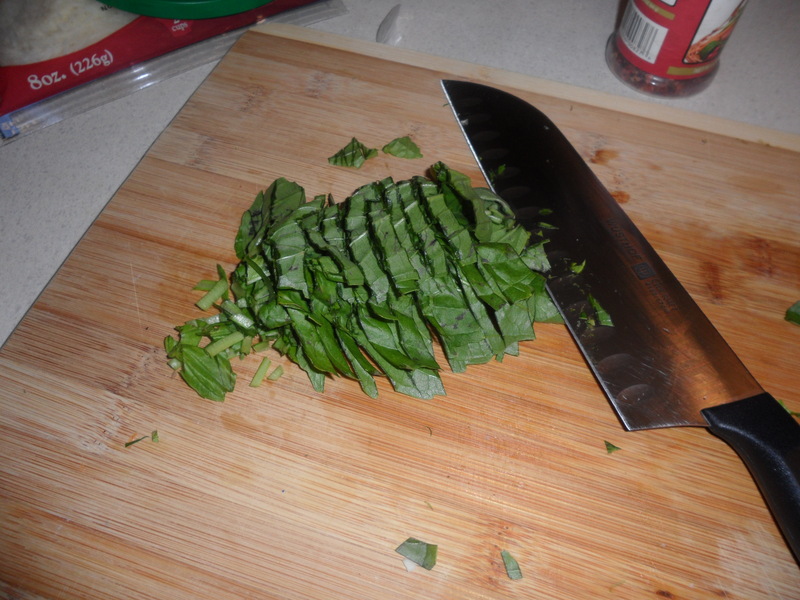 I knew I was going to stuff these peppers–but hadn’t figured out a way to tie it all together. So, I won’t say that I was inspired but he was able to practically put together the disparate parts swimming around in my brain. The boyfriend and I went kinda crazy at Winco today. Shrimp, chorizo, feta cheese, poblano peppers, eggplant… it’s going to be a busy cooking weekend. My way of celebrating making it to spring break. 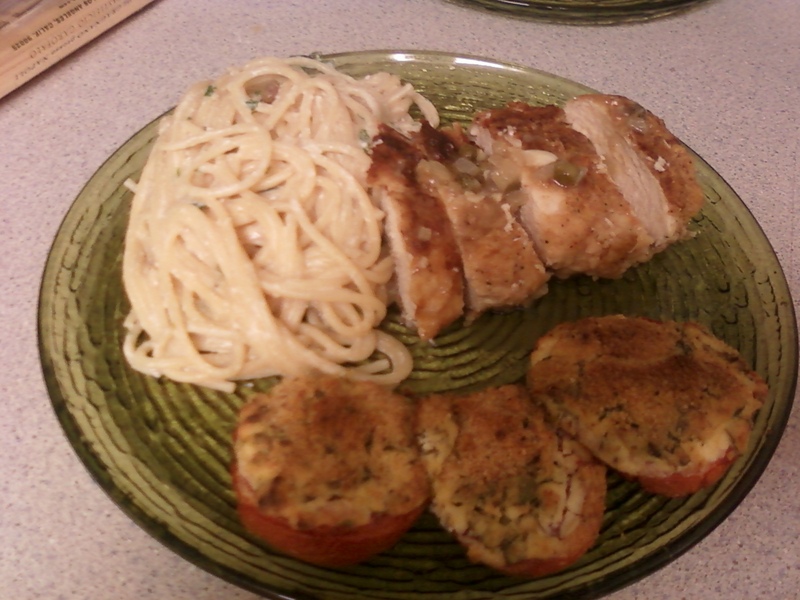 Here is the link to the Fieri recipe. Feta cheese–cotija would be more authentic, but I just like feta. tube of chorizo–oh, dear Lord, how I hate cooking with chorizo. It’s slimy, greasy, and doesn’t ever look quite right. But please give it a chance. I’m glad I did. Brown the chorizo as best as you can. It’s kind of a yucky process. I’m sorry. Drain it when it gets mostly cooked through. 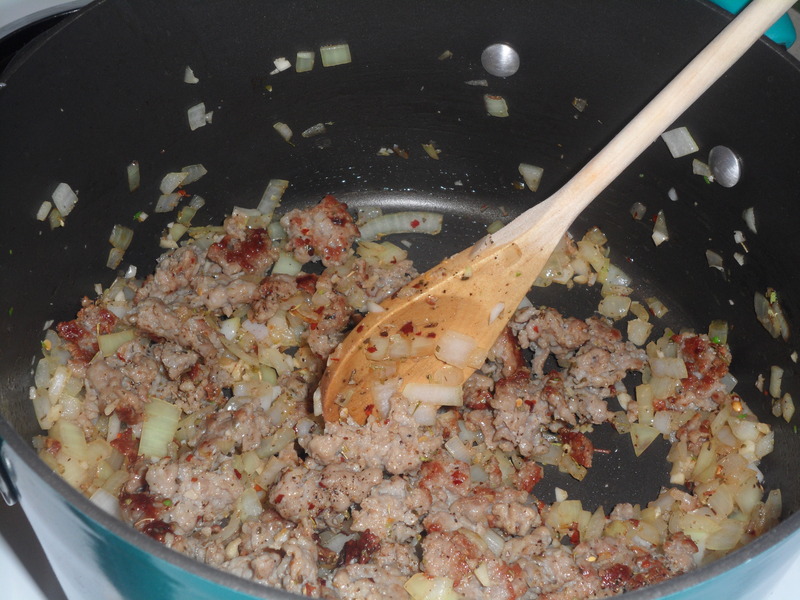 Add diced onion, diced tomatoes, and red bell pepper. Saute for a bit. Add one cup of brown rice and saute for a couple minutes. Add chicken stock and cook rice until tender. In the meantime, crank your oven up to nearly 500 degrees. Take four poblano peppers and set them directly on the rack. Turn them over with tongs every few minutes, until the the peppers are blistered and black. Take the peppers, throw them in a bowl, and cover the bowl tightly with plastic wrap. Take your shrimp, douse them with lime juice, chili powder, cumin, and salt and pepper. When the rice is done, halve the shrimp and throw them in the rice. Turn the heat off and let the residual rice heat partially cook the shrimp. Add half of a crumbled block of feta cheese. Take the peppers out of the bowl and peel the blistered skin from them. Cut a slit in them and rinse the seeds out under running water. Grab a can of enchilada sauce. Spoon some in the bottom of a casserole dish. Take a spoon and carefully overstuff your peppers. Place them in the casserole dish and cover with the rest of the enchilada sauce. If you’d like, reserve a handful of shrimp, slice them in half and lay them on top of the stuffed peppers. Cover in the rest of the crumbled feta cheese. Bake in the oven on 400 until done. 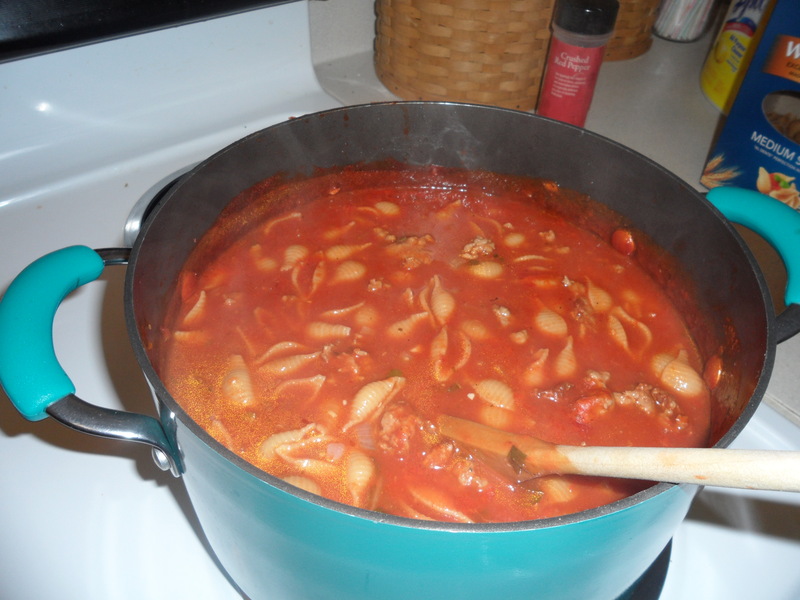 Serve with tortillas and beans.